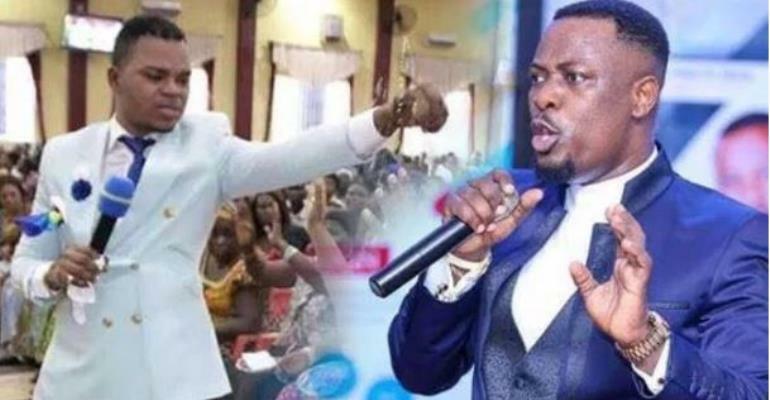 The founder and leader of International God’s Way Church, Bishop Daniel Obinim has launched an attack on Prophet Nigel Gaisie over his recent revelation that he saw Obinim in heaven in a vision. According to Obinim, Nigel’s revelation was childish and does not make sense to him. “I am not happy about it at all because it’s not making sense. This is childish. If I see you in heaven, I will ask the reason why you are here. Are you mad,” he charged. Prophet Nigel, while recently preaching the sermon in his church, revealed that God’s spirit came upon him and he found himself in heaven where he met many people who are doing God’s work including Obinim. In a video of the sermon sighted by YEN.com.gh, Nigel was heard admonishing his congregants not to judge because many of the pastors that they think are ‘good’ could not be found in heaven when he went there. “Me I saw him in heaven so don’t judge people. Don’t condemn people. The people we are saying they are correct, [the] good English speaking preachers, I didn’t see most of them in heaven. I saw this man, [a] controversial man, I saw him in heaven. I saw Bishop Obinim in heaven,” he disclosed. Prophet Nigel pointed out that though he was against parts of Obinim’s modus operandi like him giving out lotto numbers, he cannot lie about God’s prophecy about him. While this had been deemed by many as a plus to Obinim especially since Nigel has once criticised him for calling himself an angel, Obinim seems not enthused and did not mince words in his swift reply. Speaking in an interview on Soul TV, one of his many TV stations explained that if Nigel thought lotto was a sin and he saw him (Obinim) in heaven, it would have been prudent to ask why he was there. “If you claim you saw Bishop Obinim in heaven and hate the lottery, Are you mad?”, he angrily stated. Obinim further declared that he knows himself as a real angel and does not need anybody to give testimonies to that because he is capable of testifying. “I know myself that I am a real Angel from God, I don’t need anyone to testify me because I can do that myself. If you don’t believe me keep quiet,” he said.